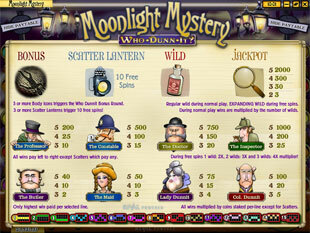 Moonlight Mystery Slots is a 5 reel 15 paylines video game released by Rival for all fans of detectives. With Sherlock Holmes as a main hero and the top jackpot of 2,000 coins that can be increased up to 8,000 coins during bonus games this game is worth your attention. Such extra features as Free Spins, wild multiplier and Bonus Round make this game intriguing and exciting to play. You can enjoy this game in no download version. Thus, you don’t need to install special software on your computer. 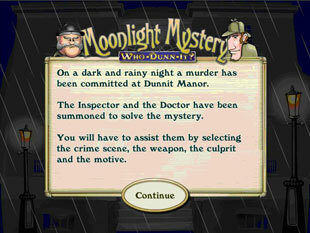 With the background of foggy streets of Victorian London, sound effects that we used to while watching some absorbing detective and animated icons of Professor, Constable, Doctor, Lady Dunnit, Maid, Butler, Inspector, Col.Dunnit, Magnifying Glass, Poison, Lantern, Body this slot invites you to reveal a mystery and win great prizes. You can choose among such coin sizes as $0.01, $0.05, $0.1, $0.25, $0.5. This penny slot allows you to cover all 15 lines with the minimum bet of $0.15 while the maximum bet is $37.5. The highest jackpot is 2,000 coins or $5,000 for 5 Magnifying Glass. The second jackpot is 1,000 coins or $2,500 for 5 Inspectors. The third highest jackpot is 750 coins or $1,875 for 5 Doctors. The Poison is the wild symbol. It can substitute any other icons except the scatter to produce more winning combinations for you. Moreover, if you get 2, 3 or 4 Poisons in winning combination, your prizes will be multiplied by 2, 3 or 4 times accordingly. In other words, you can get up to 8,000 coins or $20,000 for 4 Poison with 1 Magnifying Glass. There are two scatter symbols in this game – the Body and the Lantern. Each of them can activate bonus feature with interesting prizes. Just be lucky enough and get the necessary number of these icons on the reels. Free Spins. Hit three or more Lanterns on the reels and activate 10 Free Spins. The other good news is that the wild symbol expands on the whole reel during this feature and you will get 2x, 3x or 4x multiplier if get 1, 2 or 3 wild Poisons during this bonus game. Who Dunnit Bonus Round. By hitting three or more Bodies on the reels you trigger Who Dunnit Bonus Round. Now you can solve the mystery and win an impressive award if you manage to do it. 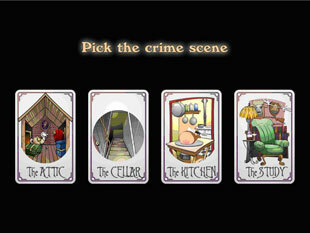 Thus, you should decide and pick the crime scene among four offered, then pick the method of murder, select the culprit and at last pick the motive of this crime. It is really captivating and thrilling feature that presents you quite appropriate prizes. 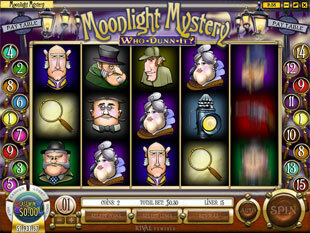 Moonlight Mystery slot machine has excellent graphics and topical sound effects that create the atmosphere of real adventure. 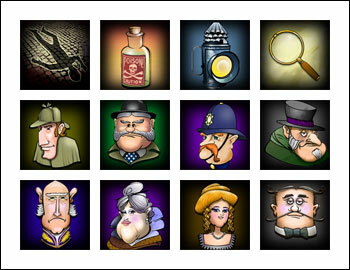 Just activate Free Spins and get the award of 8,000 coins or $20,000 or enjoy bonus round and create your own murder mystery story.